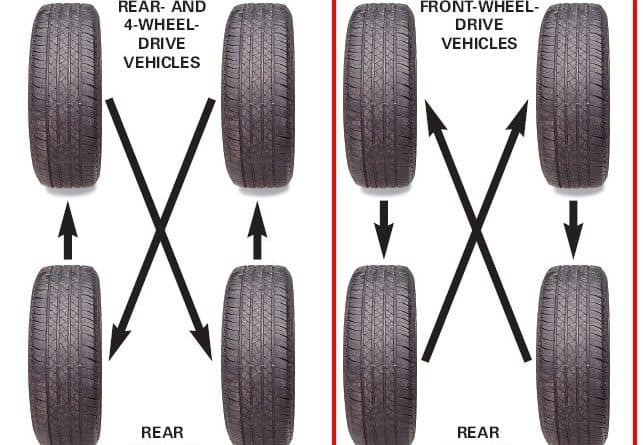 The wheels and tyres of a car should be shifted from one place to another periodically in order to ensure all tyres have uniform tread wear and longer durability. This process is known as Tyre Rotation. 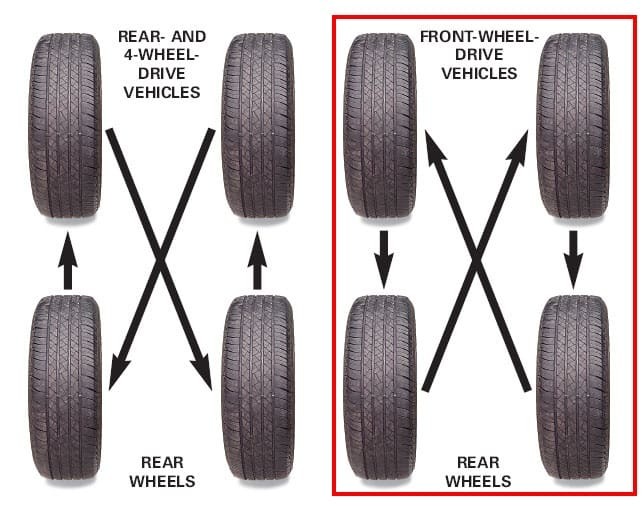 It is quite crucial for the tyres to be rotated as the front tyres generally wear-off faster than the rear ones. Each of the wheels on your car has uneven wear characteristics that makes rotation a necessary process. 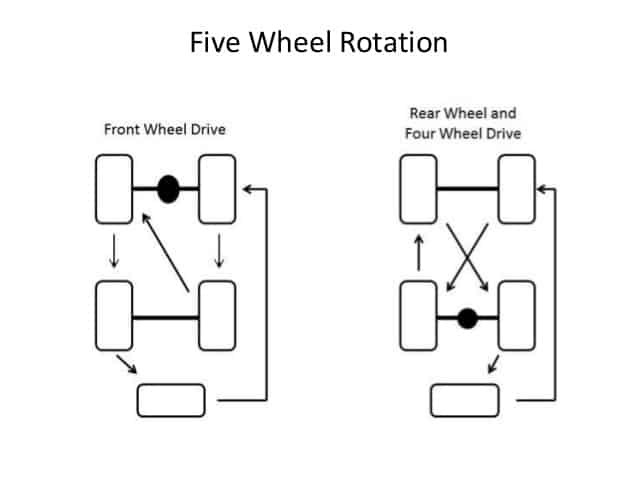 For example, we can see that the front wheel drive vehicles apply braking, steering and driving power on the front axle tyres while the rear axle tyres just get the braking forces. You can apply the four wheel rotation method in the absence of a full-size spare wheel. However, the process can not be done with the emergency tyre that is given by some manufacturers as they are generally smaller in size and can be used in limited conditions. Also, if your vehicle has a combination of tube-type and tubeless tyres, the four wheel rotation can not be done. In this process, the front tyres are installed in the corresponding rear hubs and the rear tyres are installed on the front hubs right opposite to their position. Best Suited for: Vehicles that have a four-wheel drive system are best suited for this method. This method is slightly complicated than the previous method as it also includes the spare tyre. In this process, the spare tyre is installed in the front right hub and the front tyres are put on the corresponding rear hubs. The rear right tyre comes to the front left hub and finally, the rear left tyre is taken out and mounted at the place of the spare one. On the other hand, in a four wheel drive or rear wheel drive car, the front tyres are placed in the rear but on the opposite side hubs. The rear left tyre is put on the front left corner and the rear right tyre comes out as the spare one. The actual spare tyre is installed on the front right corner. 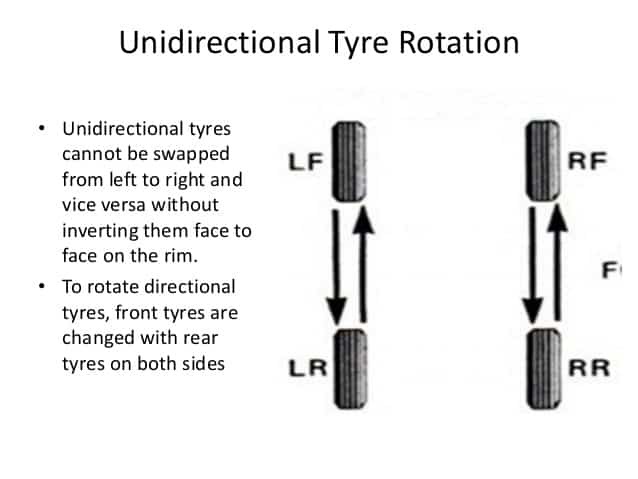 As the name suggests, the method of straight rotation is the process where the front tyres are replaced by the rear ones and the rear tyres are bolted on the front hubs right in front of them. This is quite a simple method of tyre rotation. Straight rotation came into picture in the early years of radial tyres and is necessary in case of unidirectional tyres. 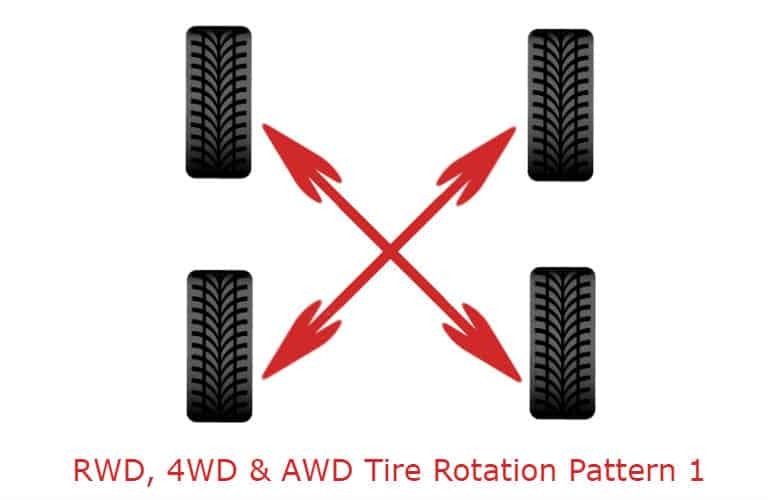 Cross Rotation is the method that includes a cross pattern of tyre rotation. It is useful for both front wheel drive and rear wheel drive cars given that the vehicle sports four non-unidirectional tyres. When this process is applied to the FWD cars, the front tyres are installed on the rear hubs straight behind their respective positions and the rear tyres come on the front hubs in a criss-cross manner. However, for the RWD vehicles, the front tyres are put on the rear hubs in a criss-cross manner and the rear tyres come straight in front of their respective positions. Also Read: How to increase Tyre Life?